Children and dogs can be the best thing that ever happened, or an absolute disaster. Kids are impulsive and don't always know when they're being too rough, and they don't know how to read a dog's body language. It is important to supervise interaction between dogs and kids, and adults need to know what the dog is saying. Every year children are bit by dogs, possibly scarred for life, and good family dogs lose their lives. These situations can be prevented, and it's not hard. When the family says, "It came out of the blue," or "We saw no signals," the adults probably missed the dog's cues. 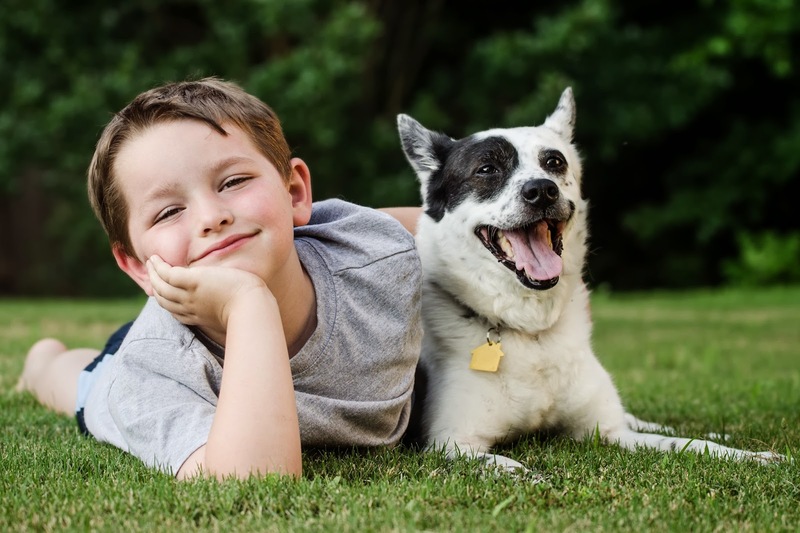 Here are some tips to keep interaction between children and dogs safe. Naturally, don't let your children run up to a dog they don't know. If you meet a dog, ask the owner's permission, and ask if it's okay to pet. Many children approach dogs from above and try to pet the face or top of the head. A dog can interpret this as a threat, especially if he or she doesn't know the child. The best way to get to know a dog is to crouch down and turn away just a bit. In doggy-language, this is polite and non-threatening, and invites to come over and say hi. It's hard to contain a child's enthusiasm over meeting a dog and probably not realistic to think a small child will crouch down and turn their back, but teach them to pet the side of the dog instead of going for the face. Gently, of course. If a dog is turning its head away, pulling its ears back, licking, or yawning, there's a good chance it's uncomfortable. When you see these signs, it's time to leave the dog alone. Sometimes news on TV report stories like, "A five-year old was bit when hugging the neighbor's dog." Never let a child hug a dog. Hugs aren't natural to dogs, and they don't interpret it as a sign of affection. A dog can be trained to accept and like hugs, but it doesn't come naturally. Did we forget some safety tips? Do you have stories about children and dogs you want to share? Excellent tips. So many dog bites could be prevented if people understood how to read their dog's body language. Thank you for coming over! I absolutely agree - many tragic endings could be prevented with just a little more knowledge.